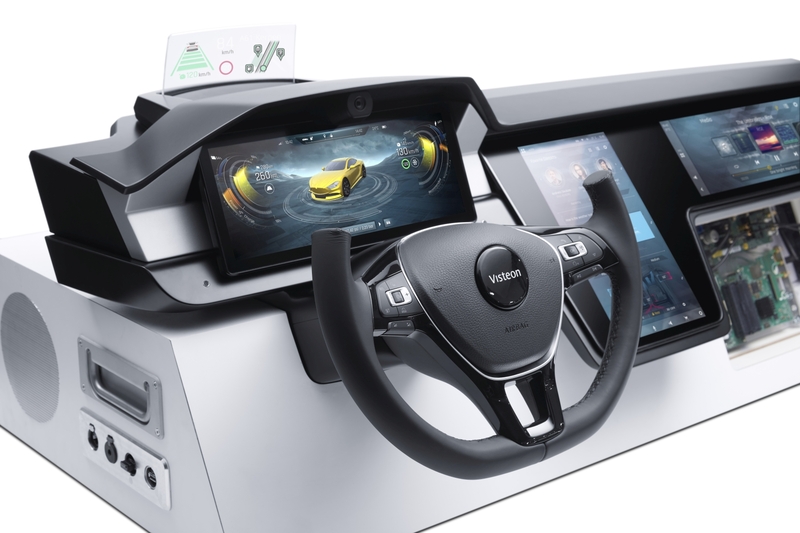 Visteon Corporation (NASDAQ: VC) today announced first-quarter 2018 results, reporting sales of $814 million, compared with $810 million in the first quarter of 2017. 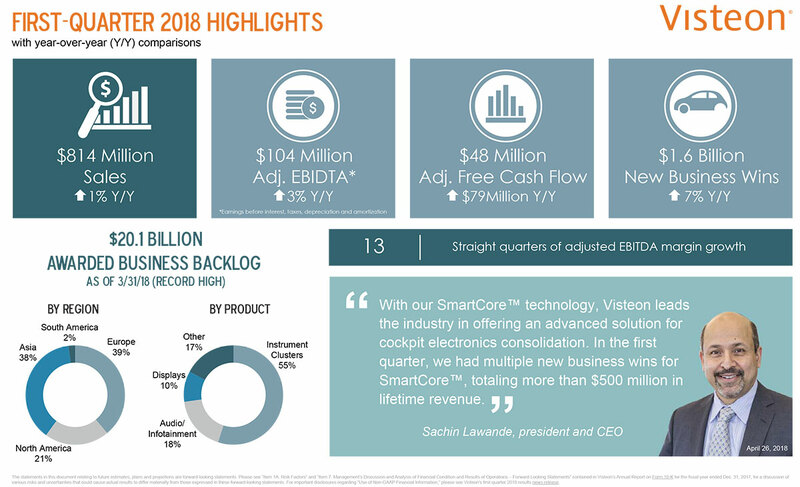 First-quarter net income attributable to Visteon was $65 million or $2.11 per diluted share for 2018, compared with $63 million or $1.91 per diluted share for 2017. Adjusted EBITDA, a non-GAAP financial measure as defined below, was $104 million for the first quarter, compared with $101 million in the same period last year. Adjusted net income, a non-GAAP financial measure as defined below, was $64 million for the first quarter or $2.08 per diluted share, compared with $57 million or $1.73 per diluted share in the first quarter of 2017. 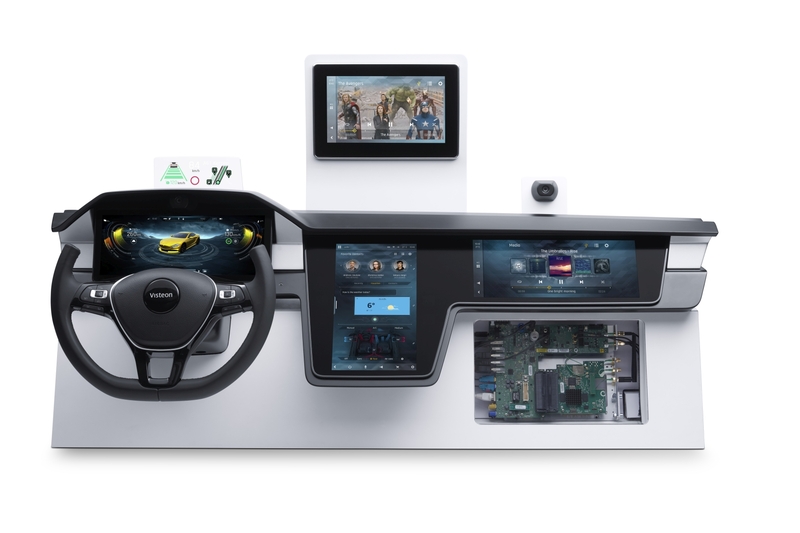 During the first quarter, global vehicle manufacturers awarded Visteon new business of $1.6 billion in lifetime revenue. The ongoing backlog, defined as cumulative remaining life-of-program booked sales, was $20.1 billion as of March 31, 2018, up from $19.4 billion at the end of 2017. Sales totaled $814 million and $810 million during the first quarter of 2018 and 2017, respectively, for an increase of $4 million. Sales increased in Asia, driven by new product launches, offset by a decrease in sales in the Americas, primarily reflecting lower production volumes. On a regional basis, Asia accounted for 39 percent of sales, Europe 33 percent, and the Americas 28 percent. Gross margin for the first quarter of 2018 was $129 million, consistent with $129 million a year earlier. Adjusted EBITDA was $104 million for the first quarter of 2018, compared with $101 million for the same quarter last year. Adjusted EBITDA margin was 12.8 percent for the first quarter of 2018, 30 basis points higher than the prior year. Gross margin and adjusted EBITDA were impacted by favorable currency and a positive business equation, partially offset by lower production volumes and product mix. Business equation is defined as cost performance net of customer pricing. For the first quarter of 2018, net income was $65 million or $2.11 per diluted share, compared with net income of $63 million or $1.91 per diluted share for the same period in 2017. First-quarter 2018 net income included a $17 million benefit in connection with a legal settlement. This benefit was partially offset by an increase in restructuring charges of $4 million and income taxes of $5 million. Additionally, 2017 discontinued operations, net of tax, included a gain of $7 million associated with the repurchase of the India operations. Adjusted net income, which excludes restructuring charges and discontinued operations, was $64 million or $2.08 per diluted share for the first quarter of 2018, compared with $57 million or $1.73 per diluted share for the same period in 2017. As of March 31, 2018, Visteon had total cash of $526 million. Total debt as of March 31, 2018, was $382 million. For the first quarter of 2018, cash from operations was $81 million, and capital expenditures were $44 million. Total Visteon adjusted free cash flow, a non-GAAP financial measure as defined below, for the first quarter of 2018 was $48 million, compared with a use of $31 million during the first quarter of 2017, driven by improved receivables performance. 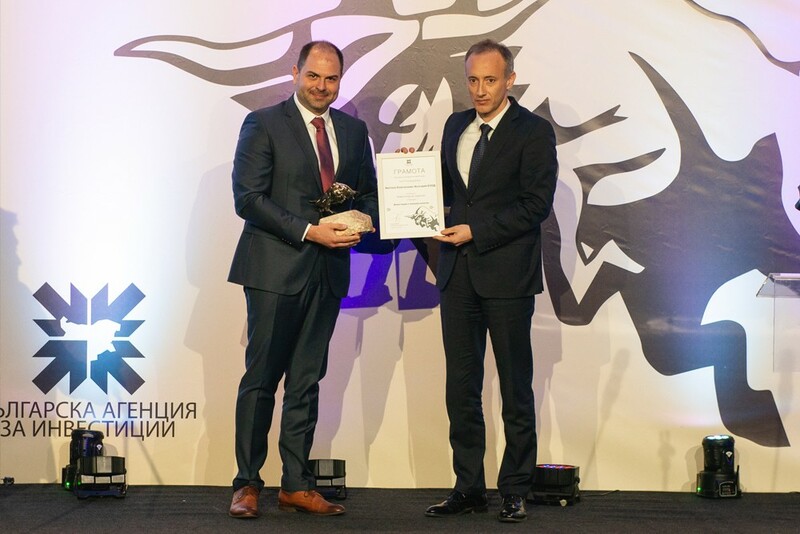 During the first quarter of 2018, the company executed agreements to purchase $200 million of shares. The company paid $50 million to repurchase 410,325 shares at an average price of $121.85 through various programs with third-party financial institutions. Additionally, on March 6, 2018, Visteon entered into an Accelerated Share Buyback (ASB) program with a third-party financial institution to purchase shares of its common stock for an aggregate purchase price of $150 million. 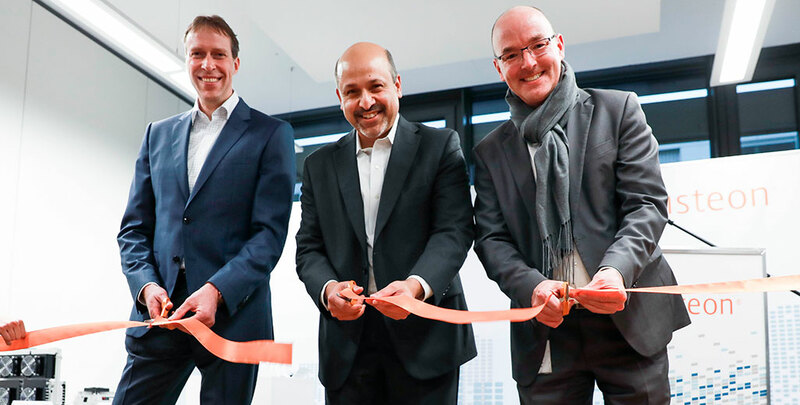 At inception of the program, Visteon received an initial delivery of 988,386 shares, which represents 80 percent of the shares to be delivered, using a reference price of $121.41. The ASB is expected to conclude no later than the third quarter of 2018. 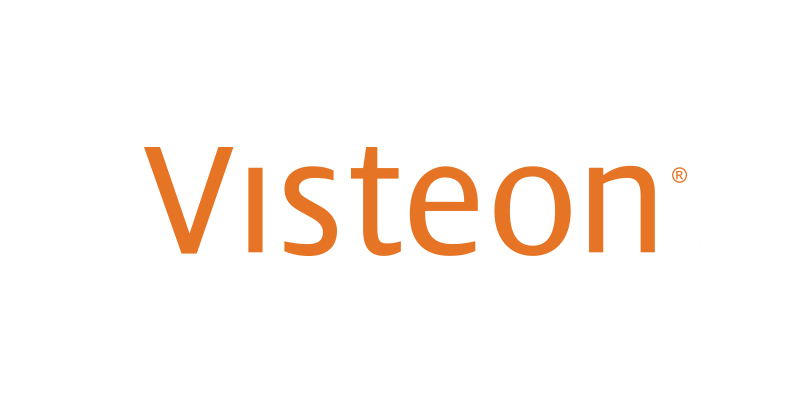 Visteon is authorized to purchase an additional $500 million through Dec. 31, 2020, under the Board of Directors’ Jan. 15, 2018, resolution. As of March 31, 2018, the company had 29.8 million diluted shares of common stock outstanding.